Students choose topics on current social issues to conduct in-depth research on, to gain added knowledge outside of class time. Each project was related to concerns present at Alameda Point. The following abstracts summarize the student findings. 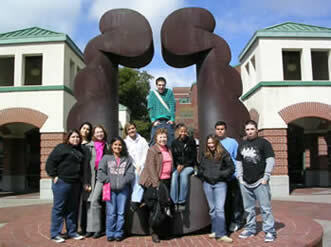 RETUrN Learning Community 2006 students are pictured at the Alameda Marina Square before visiting Alameda Point. Elizabeth Cruz "Diversity allows students to grow and experience different perspectives." Elsa Fernandez "The study of land is vital." Collin Krauthamer "Both sites are of tremendous property value." Eddie Hayes "Environmental racism is a problem "
Rita Rocha "Expenses for health care keep growing." Monique Zaragoza "We are all connected." To gain some insight on sampling for Lead in Soils, one experiment involved following an EPA Method used to screen soils. The students used a field portable XRF instrument for the experiment to quantify the lead in soil samples. This sampling experience did not occur at Alameda Point however the residence was comparable in age. Student teams were directed investigate one issue that is affecting Alameda Point. The team summaries highlight resources available to the general public and hopefully provide insight on issue and make specific references to Alameda Point sites where the issue is relevant. The summaries represent the students' perspectives on these issues and have extensive web resources as their source of information.